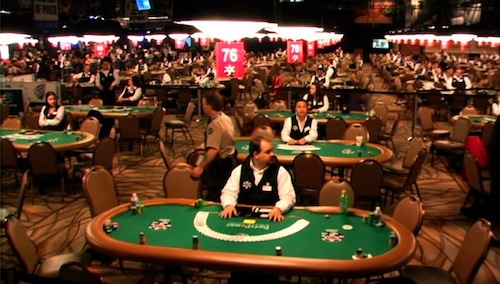 An image of dealers at the WSOP from the documentary "All In: The Poker Movie." You could argue that “All In: The Poker Movie,” a new documentary about the history of poker, especially its resurgence last decade, would have been best served being released sometime around 2006. In the mid-2000’s, the media’s fascination with poker was at its peak, as regular folks like Chris Moneymaker were winning huge sums of money in poker tournaments. While the film discusses the day the government shut down online poker sites in the U.S., it also features interviews with a variety of poker pros, like Phil Helmuth and Daniel Negreanu, celebrity poker players like Matt Damon, and journalists like Ira Glass. With help from the interviewees, the documentary relays the role poker plays in society, and the changes the game has undergone this century. “All In: The Poker Movie” will be playing at 8:15 PM on Monday, April 23 at the Gene Siskel Film Center. Tickets are available via Ticketmaster, but we have a pair of tickets for you to win. Just Tweet at us (@manupchicago) with the phrase, “I want to see the poker movie,” and the tickets are yours. Or email us at mark@manupchicago.com to win the tickets. Of course, the tickets go the first person who sends us the Tweet, so, move quickly if you want to win. (Sorry, we have winners, so the contest is over). If you can’t make it to the movie, the digital release of the film is April 24. You can purchase a digital copy for $14.99, or for $19.99, buy a digital version and a DVD. There’s also a deluxe package available if you’re into such things. Visit the “All In: The Poker Movie” website for more details. Trailer for the movie below.